More than half of the peak-time traffic to the London 2012 Olympic Games' web servers came from mobile devices – a huge demonstration of the consumer switch to mobile at the highest–profile sporting event of the year. 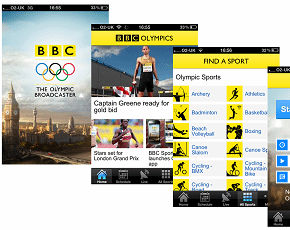 Users were either running London 2012's own mobile app, or accessing real-time results information using other mobile apps and websites such as the BBC (pictured). In an exclusive interview with Computer Weekly, London 2012 CIO Gerry Pennell said that a big increase in mobile use was expected, but the extent of the traffic still came as a surprise. "The most compelling statistic is that at peak moments over half the load on our web servers was coming from people either accessing the mobile site or using the mobile app. We expected this to be big in London but I wouldn’t have guessed it would be that big," he said. The BT-hosted web servers supported over half a million concurrent users at peak times. "It was pretty hot," Pennell added. London was the first Olympics where live results for all sports were delivered through the website and mobile apps. "What was interesting was the interaction between those two things - the combination of live results available and people being able to get it on a mobile basis meant there was more volume of people looking for the latest updates than we had anticipated. We had to tune some things to make it work, which went fine," said Pennell. "One of the highest peaks in the website use and mobile use in particular was the Andy Murray tennis final, just seeing the volumes coming through. Those needed tuning and managing as we went." One of the biggest technology challenges for London 2012 was ensuring that mobile users at the various sporting venues around the capital were able to access networks to communicate as the action was taking place. London 2012 organiser Locog set up a Joint Olympic Operators Group (Joog) with the UK's mobile network providers, to work together to ensure sufficient mobile capacity was available. "One of biggest achievements was the way the mobile network operators came together under our leadership in Joog," said Pennell. "They invested in a lot of shared infrastructure on the Olympic Park and off the park, which meant we were offering a much better level of mobile networking experience at our venues than would be typical at a normal sporting event, so you could access everything on your device and share pictures and all the rest of it." A similar approach was taken with BT to provide Wi-Fi capacity at the Olympic Park in Stratford. "BT put in the world's largest high-density Wi-Fi system to enable those services to be accessed from people's devices, and it all worked very well - my main measure being the absence of complaints," said Pennell. The CIO said that the approach to mobile and wireless networking has raised the bar for future Games. "The big difference between London and previous Games was that this was the Games when the consumerisation of technology really hit what the Olympics had to deliver," he said.